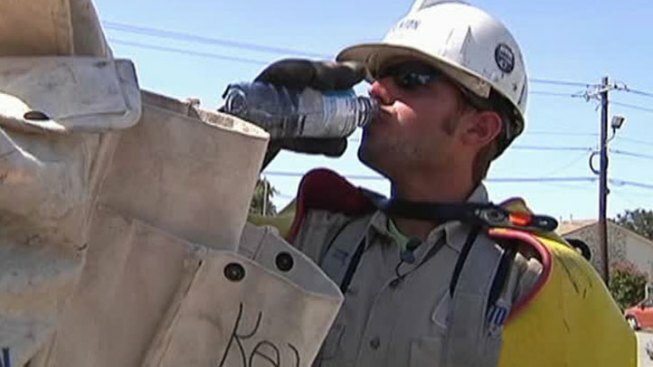 Electric workers are braving the heat so North Texans can crank up the air conditioning. Denton Municipal Electric linemen say the summer is the most grueling time of the year. Their job can be dangerous, and so can the heat. Randy Key, a lineman for DME, said it takes a lot of gear to do his job. Rubber gloves and rubber sleeves are just two pieces of protection that must be put on to work on power lines. "It intensifies the heat a lot, especially with our long shirts and 108-degree weather," he said. You are just drenched in sweat." The buckets they work in tower above trees and provide no shade, leaving the workers blistering hot. Despite the heat, they realize their job is important. As the temperature increases, more pressure is put on the electric grid. "The reason we are doing it is so they [the public] don't have to have a power outage," Key said. Matt Warschun is a senior lineman for DME and said the crews stay hydrated, find shade when they can, and keep a positive attitude. "We laugh about it and keep going. You just have to," Warschun said.